A hail back to Chicane's Balearic roots. Long considered a master of the Ibiza sound, Chicane (also known as Nick Bracegirdle) has seen definite highs and lows in his career. He was praised early on for his calm yet energizing works such as "Offshore" and "Saltwater" before hitting it big on a more global scale when he teamed up with Canadian rock icon Bryan Adams for the dance hit, "Don't Give Up". He suffered an unfortunate Internet leak of his 2003 album, "Easy To Assemble", resulting in Chicane becoming rather disdained by the industry and disappearing from the scene for a few years. His later return, however, was triumphant as he was able to collaborate with legendary crooner Tom Jones for his first new single in several years, along with a somewhat new direction for his music -- more pop-oriented than ever before -- on his 2007 album, "Somersault". And then he returned once more with "Giants" in 2010, stepping back into the more Balearic sound that he has once signified. "Giants" indeed looks to the past for influences, but it also sounds simultaneously modern, keeping in touch with popular club trends. Starting off with Barefoot, it's amazingly clear that Mr. Bracegirdle has not forgotten the style of music with which he was made famous. Prepared with very few beats to keep it chuffing along, it boasts a heavenly mixture of pads and electronic flutes to create the aural illusion of a cloudy journey... perhaps one where you don't need shoes (hence the title)! This trance-like state quickly dissipates when the next track, Middledistancerunner, rears its house head. Joining with the vocal stylings of Adam Young, that fellow from Owl City who often overenunciates profusely while singing, this song's more of a standard trance/house track, though Mr. Young's vocals do add a bit to increase my overall interest. I do believe, honestly, that the song could easily survive without vocals at all, as the background melody is swell enough and reminds me of Chicane tracks of olde. If you like Owl City music, you'll like this. If not... well, you might just still like it, but you won't be a fan of the vocals. This song was released as a single in August 2010 (the same day as this album, actually), but only hit #173 on the UK Singles Charts. Telling? Next is Come Back, not a song I've ever REALLY admired, but still adding some variety to the album beyond the styles of the previous tracks, having a more directly trance feel to it. This song is a retooling of the 1983 track, "Come Back and Stay," by Paul Young, featuring the original vocals overtop the funky trance beats. I've never heard that song before, but it must have inspired Chicane to some degree. Considering I'm not a fan of this, I skip to the next song, What Am I Doing Here? (Part 1). And let me tell you, THIS is one not to miss. Immediately when you hear the female vocals, you will be reminded of that song, "Hide and Seek", by Imogen Heap, with its heavily vocoded choral singing. It's a beautiful melody that slowly grows with pads and organ synths in the background until we conclude with vocoder-free vocals asking, "What the hell am I doing here?" Well, I know I'm enjoying the song, that's what I'm doing here. I'd consider this one alone to be the highlight of the entire album. Suddenly, the title track, Giants, swoops in with some strange, disjointed faux-trumpet noises and I wondered what the heck was going on. Eventually, the song transforms into another trance track that partially resembles "Come Back" closely in terms of background harmony; in fact, to someone with a less-than-attentive ear, the two tracks might be interchangeable in this sense. "Giants" isn't terrible by any means, but it's definitely one that may be given up on after a few listens. Ears can be perked up again, however, by the arrival of Poppiholla (5AM Mix). "Poppiholla", initially a much peppier version of the song "Hoppípolla" by Sigur Rós, became a rather significant hit for Chicane in 2009, and so he provides a mix of that track here. Though not particularly varied, it's a fairly chilled track for relaxing on the beach or relieving stress after a hard day. So Far Out To Sea is another ambient track, this time featuring the vocals of Tracy Ackerman. Again snagging the shoreline sounds of the Balearic Island, this one's very deep with multi-layered pads to create quite the overwhelmingly ambrosial effect on the ears, the mind, and the heart. It's not for everybody, but like "Poppiholla", it's good to relieve tension or just to chill out. Where Do I Start?, the final single of the album, sets itself up as another vocal trance tune. It may take a couple of listens before it grips itself on most people, but for me, it never really stood out as anything notable. Luckily, I was perked up by From Where I Stand, which drives down that same funky trance avenue as before. The vocals of the mysterious I Love Lucy, I swear that her voice MUST be vocoded/sprinkled with auto-tune; if they're not, I'll be a monkey's uncle, complete with ape suit and banana fetish. ...wait... Anyway, this is a pretty upbeat song that has a bit of a guiltily poppish hook adding to this cool trance offering. No matter who you are, you'll recognize part of the next track, Hiding All The Stars. Though it starts out sounding like a typical trancer, we're eventually visited with another blast from the past: the swift electro-melody of Gary Numan's "Cars", one that is instantly recognizable no matter where it's placed. Soon enough, it's melded well with the original vocals. According to Chicane himself, this (along with "Poppiholla" and some other currently unreleased tracks) was supposed to appear on the "Re-Work EP", which would have featured other retoolings of classic songs in a modern electronic style. However, due to major legal issues late in production, the project was quietly scrapped, though a couple of the songs ("Hiding All The Stars" being one of them) shuffled their way here. And we are happy. Next is What Am I Doing Here? (Part 2), featuring the vocoded vocal style featured in Part 1, but with the male vocals of Lemar. Meant as (naturally) the follow-up to "What Am I Doing Here? (Part 1), it's a bit more minimal than other tracks on the album. Sadly, it's also less catchy; the song was much better with the female vocals and should have remained a one-parter. Luckily, Chicane decides to end in his expected fashion: with a symphonic suite to relax us after a long journey of dance beats, courtesy of Titles. ...though if you picked up a physical copy, you'd also get Middledistancerunner (DC Rework Edit), which is basically a remix courtesy of Chicane himself ("DC" standing for "Disco Citizens", one of his working aliases). It's not THAT much of a stretch from the original, but it's far more conventional in structure than the original, if that's what you like. Overall, I am fairly satisfied with this album. 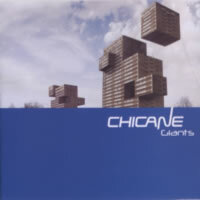 Though it has a few less-than-stellar bumps along the way, it's a generally beautiful voyage through trance and ambient music that will easily remind longtime Chicane fans of precisely why he became so beloved back in the late 90s, all the while remaining modern in composition. If you find this one, give it a spin!